January 18 2017 - Sgt. Maj. Erez Levi, 34, was killed this morning in the line of duty in a vehicle ramming attack in the Bedouin village of Umm al-Hiran. 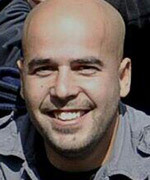 Erez joined the Israel Police in 2002, and was recognized as a distinguished policeman in his unit in 2012. He was killed during violent clashes in the Bedouin village of Umm al-Hiran in southern Israel, when police and other security forces arrived in the village to carry out a demolition order against illegally constructed homes. The violence, which included the exchange of gunfire between police and the village's residents, broke out after one of the residents attempted to ram his car into security forces and was shot to death. Erez, 34, is survived by his wife Carla and two children aged 5 and 2 years old.